1. How not being able to get focused on a niche was making it tough for Cam’s messaging to resonate with the market and charge for his services. 2. How joining Consulting Accelerator and the Consulting Community helped Cam feel comfortable as an entrepreneur and being able to provide value to people. 3. Why committing to his goals on a sheet of paper helped Cam in his business and personal life. 4. Why Cam interviewed his niche to understand their pain points and hone in his offer and messaging. 5. How market research allowed Cam to rapidly learn the necessarily skills to help his niche and charge for his services. 6. The most transformational thing Cam learned from a recommended book in the program. (Relentless). Always showcase and focus on your successes even when you think you’ve failed. Turn negatives into positives. Be a net asset, not a liability. Also, ask for help if you need it and don’t let your “failures” keep you down, grab the experience as an opportunity to grow and improve. Sam Ovens:	Hey, everyone. Sam Ovens here, and today I've got Cam Erickson from Six Point Strategies. And he's a Consulting Accelerator member, and he joined a while ago now, and before joining, he was kind of doing some political advising. Like, he was offering his advice and helping people with their campaigns, and he wasn't able to charge money for it, though. He didn't really have a business or defined niche and a defined offer. And through joining the Accelerator program, he was able to really niche down, find his focus, create offers where he can actually charge people money, and now he's got a proper business set up called Six Point Strategies where he basically helps candidates run for office and get elected through social media and digital marketing strategies. So Cam, how is it going? Cam Erickson:	It's going really well, Sam. Thank you so much for having me on. Sam Ovens:	No problem. So first of all, why don't you just explain exactly what your offer is and what you help people do? I gave people a little sound bite, but I'm sure they're wondering is there anything more to it than what I was just said? Cam Erickson:	Yeah. It's really cool what I have the opportunity to do now. I have a background in political campaigning and would sometimes work on a campaign 90 hours a week and do it for very little pay. And it's really given me the opportunity to help candidates with social media and creating list funnels for them to acquire more email address and then I help them basically email their lists and update them on how the campaign is going and get contributions and more supporters for the campaigns that I'm working with. Sam Ovens:	Awesome. What was your situation before joining the program? Cam Erickson:	Before joining, I just wrapped up my sixth campaign. It was a Congressional campaign in Wisconsin, and by the end of the campaign, you're completely exhausted. And I went back to Chicago, and I had this vague notion of being a consultant, and I had a friend, for example, who was running for state legislature, and I met with him and we were grabbing beers. And I didn't really know how to really pitch myself. I knew how I could help him, but I didn't know if I should call myself his campaign manager or advisor or consultant. And by really honing in ... So I wasn't able to hone in on a niche and thus it just left this potential client and friend confused about what exactly what I was offering. And he didn't really see where I fit into the whole picture. Sam Ovens:	And you said you weren't charging, either. Cam Erickson:	No. Once in a while, I would throw some figures around, but again, it was confusing whether would I be a full-time consultant or would I be like a campaign manager? I didn't even know and so I left the client unknowing whether to pay me. And so a lot of my friends would call me up and I'd be giving them advice. And I knew how to help them 'cause I have a background in it, but I was just giving basically free advice. Sam Ovens:	Got it. And then tell me how you found Consulting Accelerator and what made you want to join. Cam Erickson:	Yeah. I never heard about Sam Ovens or the Consulting Accelerator until a friend of mine who I was just visiting in New York in Washington Heights area, and I was talking to him. And he's like, "You know, it sounds like you are really into this idea of starting your own business. I saw this guy on Facebook once, and he gives a free course on consulting." And so I found you and took the course and I really was able to see the tremendous value in it. And it only took a short amount of time for me to completely make the investment and make that money that I invested into the program back. So it was really just a friend that saw you through your Facebook ads, and I took the course and it really worked out well. Sam Ovens:	Cool. When you joined, what did that process look like as soon as you started going through the training? Cam Erickson:	As soon as I joined, one of the first things I did was join the Facebook consulting community. And it really blew me away because the course instructed me to introduce myself, and I didn't exactly know what I my niche was, but just by saying, "Hi, hello, how is everybody," I saw that the community was really friendly, and a lot of people, just going through the comments were going through a lot of similar struggles that I was going through. And it make me feel less alone in my situation. And I also was able to see that some people are actually in much better shape and much more advanced in their niche and their high value offer, and there's also other people that are a little bit behind that maybe don't even have the skills that I know through your taking course and through helping them are gonna definitely get to a point of making a six-figure business, so it's just incredible the support that people give. One of the things that started out with the course is that you should really help other people before you ask for help yourself. And that was really meaningful to me because it made me feel as if I can really provide value immediately even though I'm really just starting out. And it's been an incredible experience from the get go. Sam Ovens:	And then what about going through the specific training modules like picking your niche and crafting your offer and all of that? How did that start to take shape for you in your business? Cam Erickson:	So I felt really blessed that I already had a lot of contacts in the political industry. And I had never thought to actually interview them and ask them questions about their niche. And these were sometimes former campaign managers that I worked with, these were sometimes former staffers or candidates themselves. And the idea to call 10 people and interview them about the niche, many of whom had already went into consulting, was a really great opportunity for me to really hone in on what exactly is keeping these clients up at night, what is keeping them staring at the ceiling, what is one of their biggest fear and how serious are they to fix it? And that itself and just talking to people in the industry was incredibly helpful. And then when it came to creating kind of a goal sheet and lifestyle that I see myself in, it's an exercise that I've done kind of mentally, and I spent a year actually in Jerusalem in 2015 to 2016 working on my spirituality and things like that. But it is actually never something that I committed to paper, so just being able to commit my goals to paper and listing my mentors and my physical business, professional health goals was extremely important just for my personal life as well as for my business 'cause you can't really have a successful business if you're not getting your life together in a positive way and growing in a positive direction. So just every aspect of that, whether it's doing interview with the people in the industry, working on your lifestyle and goal setting and also just working in general with honing in on your niche were incredibly helpful and everything was faceted and worked its way into the program very, very well for me. Sam Ovens:	Cool. So just to understand quickly, you knew had this interested in doing political consulting and advising and stuff, and you were doing that kind of for free and everything. And then you joined Accelerator to try and figure out how to turn it into a proper business. So you pretty much already knew what your niche was gonna be, which is helping people with their political campaigns and things because you were already interested in that everything. So for people listening, that's a good place to start. Quite a lot of the time when it comes to picking your niche, just something you're interested in, passionate about, that's a good place to start. But then what you said is you decided to start interviewing them and understanding them and understanding their pain, their problem, what keeps them up at night. And that is such an important step. Understanding the person and what their problem is. So let's zoom in on that. What did you find to be their problem? Cam Erickson:	Yeah, so the problem that a lot of people had, especially if they're running for office for the first time, was fundraising and making money. And I think that's true for a lot of businesses. They just want to be making more money, and frankly, I really believe that the world is a better place when everybody is making more money. When it's a win, win, win for everybody. It's a symbiotic relationship. So just talking to people and my former friends, A, it was an amazing opportunity to just reconnect with my friends and former coworkers and do networking. It really surprised me how receptive people were if you just reached out to them on LinkedIn and said you'd love five minutes of their time. So that in itself was incredibly helpful, but I think the thing keeping people up at night is definitely making money. And also, how do you make the people that aren't your friends and don't know you into your friends and have them know you because when it comes down to running for office and winning at any level, it's gonna be about name recognition and making the people that don't know you know you because it's not about who you know when you're running for office, it's really about who knows you. That's really one of the main things that as I went call after call that I was really getting a theme on. Sam Ovens:	Got it. And why money? When it comes to political campaigning, why is making money important? Cam Erickson:	It's really important because a lot of these campaigns will hire full-time campaign managers and also finance staffers, and basically it's kind of funny. They're hiring finance staffers and paying money so that they can make more money and research more donors and be doing things because you need to, like I said before, make people who don't know you know you. And really the only way to do that, aside from marching in parades and going and pressing the skin and going to pubs and schmoozing with people, which is all well and good, is to make impressions on social media. And when you have three, four, five impressions, which is definitely the bare minimum that it takes in order for people to start recognizing you, it's really good because usually people won't even click on something until they see it three, four, five times on social media. And once they do that, it's a great way to be able to reengage with them in other modes of communication, including email. And you can work with the client, and when you're in a strategy session, you can explain this to them in a bit more vague detail and answer their questions so they have a really clear picture of what you're doing because they need money to hire full-time staffers that are working 90 hours a week, and they need money for lawn signs and for literature to pass out on doors. I'm not saying that money is gonna necessarily correlate to you winning, but it's certainly going to help you. Without getting too political, I'm not gonna reveal my political views here or anything, but in the 2016 Presidential Election, Hillary Clinton significantly out-raised Donald Trump, and she still lost. Part of that could have been because she had too many cooks in the kitchen, but definitely because she really didn't hone in on her niche, she didn't hone in on like a niche in a way, so money doesn't always correlate. It's not just how you raise how much money, but you need to be able to spend it in a very smart way [crosstalk 00:14:33]. Sam Ovens:	She had like the old model, right? I remember she did a concert with Jay-Z. Just got a celebrity endorsement in there, and it's like, could there be any two people that are more different? Jay-Z and Hillary Clinton? Cam Erickson:	No. Sam Ovens:	And then Trump, he invested all of that money into smart digital marketing and ads and things. Cam Erickson:	Yeah. Mark Zuckerberg, I saw some people talking about it on the Facebook page yesterday. You know, Mark Zuckerberg was testifying on the Hill yesterday, and it's been very ... And it's really all because of the digital marketing. Trump definitely invested in that and had it down with the Cambridge Analytica stuff down to a T, so when you're raising your client money, they will trust you to spend the money and really help them allocate it in the best way. And it's really meaningful because you're providing a lot of value to your client in a lot of different ways and ultimately building relationships, making them very happy. They're gonna be throwing more business and cool opportunities your way. You open one door, you open another door, and that opens another door. I mean, people have come to me for things actually outside of my niche, and they're paying me large sums of money to do things that are politically related just because they've heard of me and have met me and it's a good direction. Sam Ovens:	Got it. So you knew what your niche was, then you jumped into Accelerator, you started researching this niche. You found this problem which is raising money so that they can use that money to make more people know them so that they can win. It's kind of like the three steps, right? So that makes perfect sense. So then what made you think, "All right. This is a problem that I think I can solve"? What made you to understand that? Cam Erickson:	Right. I think it's really important, back to what you were saying about the Jay-Z and Hillary thing, it couldn't be more different. And it could be that she needed somebody like that to really fill up her arenas 'cause she was having some difficulties with attracting crowds, and Trump was filling the stadiums full of people. So was Bernie Sanders. Bernie Sanders was filling stadiums full of people, and it's really how do you get the enthusiasm, how do you get the butts in the seat, how do you get your message out there and hone in on it, and by raising money, I'm was able to realize just how important this is to a campaign. I talked to a candidate who ran for Congress as I was doing my customer research, and he told me that he sometimes sits in a room every day for five, six hours at a time just doing call time, calling people for money, so it's so ... Especially in the American political system. I'm not saying I'm a fan of it 'cause I know other countries do it a lot differently with public financing and things like that, but especially in the American political system, it's so important. And it's a shame, personally, but it's something that there's definitely a demand for. And I'm not gonna apologize for helping people that I believe in raise more money and get their name out there and get more butts in the seat and get more people to vote for them ultimately. Sam Ovens:	Yeah, but what really made you think that you could help them solve their problem with your services? Cam Erickson:	Right. I had prior experience with campaigns, and I saw that I had a certain amount of skill and was able to know other people as well that worked on social media very well. So at the beginning, I was subcontracting some of the work to my associate. And I was finding new clients, he was kind of doing some of the work, but it's been an amazing growth experience for me to be able to take over some of the responsibilities that I subcontracted and work on Twitter and Facebook while he works on Instagram. So there's definitely nothing wrong with subcontracting as part of the course even if you don't have all the skills all the time. And something that I want to really stress to the people watching is even if you feel like you have no skills, you can very, very quickly learn a new skill after you do market research in a niche that you're interested in or think can make you money. And you can learn skills very quickly that provide tremendous value to your clients. Sam Ovens:	Got it. And so you picked the niche, you identified the problem, you thought you can help with this, then how did you get your first client? Or your first paying client? Cam Erickson:	That's a good distinction. I got my first client actually through a referral. And it was a friend of mine, and he said, "Hey, I don't know how you're gonna help this lady, but she's running for judge, and I think that there might be some synergy there. Again, I have no idea how you're gonna help her, if it's gonna work, but here's an email intro." So I followed everything to a T, I sent out a scheduling link, I sent out a quick survey along with the scheduling link, and got her on the phone. I used the sales script and hadn't quite memorized it by that point, so I was just using it. And already had crafted it to fit my niche 'cause there's certain things, obviously, with every niche you have to modify with it. And she said, "Yes," and I was like, "Wow. That's my first paying client." And she's like, "Well, you know, I got to kind of talk to my finance director. I'm okay with it, but I got to talk." And just using your strategies, I'm like, "I totally understand if you want to talk to your finance director. No problem. Why don't we just get him on the phone right now?" And so she's like, "Okay." So she three-wayed him in, patched him in, she's like, "I want to go with this guy. I trust him." And within 24 hours, I got my first payment of $3,000. That was monthly recurring for many, many months, and it worked out really well for both of us. Sam Ovens:	Nice. So what were you offering? So it was three grand a month recurring. How did you structure that offer? What were you promising to do for that price? Cam Erickson:	Yeah. I was promising to really ... At that point, the client was in rough shape. She was very, very scared of her chances of winning, so I offered to ... I said that my area of expertise is really working with candidates who are running for office for the first time, and I help them win through devising a campaign plan for you and really helping you with social media and connecting with voters to execute that. And then I just shut up. She's like, "That is me. That is really me." And I wouldn't have been able to do it had not asked her the questions before and tailored the offer as I went. So it's really important to listen and take notes. That was a really good feeling when she's like, "Wow, that is me." So that's how I crafted the offer to her. Sam Ovens:	Got it. Cam Erickson:	And I- Sam Ovens:	And then- Cam Erickson:	I'm sorry. I also was able to ask her how much money are you currently raising, where do you want to get to, and six months, which was when the election was, and say, "You know, I typically help candidates get from raising X amount of dollars per month to Y amount of dollars per month." And I would have really never thought of doing that. It's just part of the sales script. Like I said, it's important to modify it but it's good. Sam Ovens:	Got it. And you're now at six grand a month, so I take it you got another client as well? Cam Erickson:	Yeah, so I- Sam Ovens:	How did you get that client? 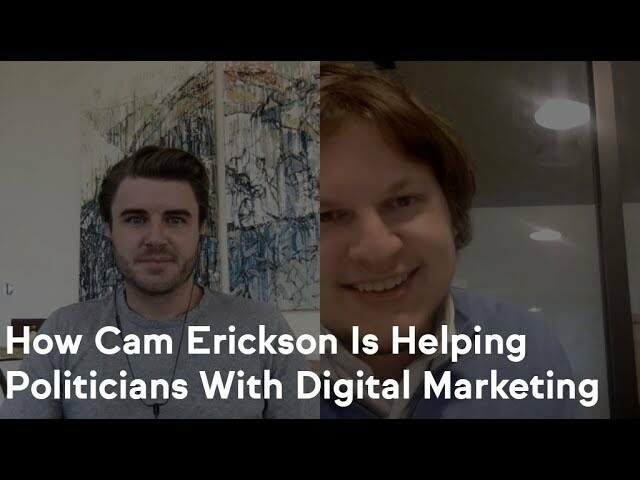 Cam Erickson:	Yeah, so I got that client because I like to travel a lot, and basically he, as part of this first client I got, I was able to invest a lot of money in people around me and my website and working on getting my company more recognition. And it was really ... I originally met him when I was traveling last year in the Middle East region, Iraq, and I kept in touch in with him, and just by knowing my niche and just by persisting and putting in constant daily effort, sometimes opportunities will come to you. So when he told me that, "I need help with this special project. I need to get ..." Basically he needs to fly 50 people over there to observe elections and he needs some election support. And he tasked me with this job. And when he asked me if I'd be willing to help, I was able to really be ready, I was instantly with the sales script and everything and be able to craft a very high-value offer. A year ago or whatever before I took the course, I probably would have just been like, "Oh, yeah. Just maybe pay for my travel, I'll fly over there, and it'll be a free trip." I wouldn't have even thought really or maybe pay me thousand dollars. I wouldn't have thought to say, "I'll do this for you for $4,000 a month." And I get a 10% cut basically of anybody I hire for him. I get $270 bonus for every person that I bring over there to Kurdistan. And if anybody wants to go to Kurdistan with me next month, let me know. I'd love to basically take people on a free trip to Kurdistan, it's very trusted. So it's a really cool opportunity and just through networking. Also, always constantly stressing you are the vehicle or where they are to where they want to be. You are that vehicle that can get them there, so even if you don't close right away, as long as you keep stressing that, don't work for free. I'm telling you. Don't work for free. Know your value and your worth. You will get it, and it'll work out for you. Sam Ovens:	Nice. Nice. Well, congrats on getting to six grand a month. How doe that feel? Cam Erickson:	It feels really great because I have a work-life balance now. I'm not working 90 hours a week and I'm making three times, three to four times what I would make 90 hours per week. And I work Monday through Friday, usually go from 9:00 to 6:00. I can take an hour-long lunch break and not let anybody know, and I'm able to have more flexibility and I work half days on Friday, I don't work on the weekends. Before I was working Sunday included and everything, and it's just great to have work-life balance and be able to go on vacations when you want, work from anywhere. I was just in Boca Raton a week ago. That was really nice, and it's just great to not have to answer to anybody and be able to work on your own schedule. Sam Ovens:	Nice. You were able to go from working 90 hours a week and charging zero, which I don't know how you were doing that but you were doing it, to now working less and making six grand a month, which is awesome. What would you say after going through the Accelerator program has been the most transformational thing for you? Cam Erickson:	Definitely a book you recommended that we read, which was the book by Michael Jordan's coach. Sam Ovens:	Relentless. Cam Erickson:	Relentless. There's three categories of people, and the top two categories, you can be a closer or you can be a cleaner, and really, that just totally changed my mentality reading that book. I literally finished it in two days. It applies to so many things because you can be a benchwarmer who when your coach calls you up, you'll get up there and you'll go play, or you can be kind of the closer in the middle who is ... So the first category was the cooler. You can be the closer in the middle who might be up there on his feet encouraging his friends and getting out there and saying to the coach, "I want to go play." Or you're just gonna be the cleaner who just grabs the ball, goes and makes that slam dunk and is unsatiated. Once you make that dunk, you want to do it again, you want to do it again. And you don't ask for recognition, you just work until the job is done. And that's because that's your job. That's what's to be expected. So that book really changed my life. I probably would have never thought of reading a sport-related book if I didn't take the Accelerator 'cause I'm more of a baseball guy, but it was really great and just the whole training, the whole mapping out your goals and life and creating a collage of people that you'd like to emulate and be like and things that you like seeing, the thing. I'm not satisfied yet with 6,000 a month. It's for sure way, way, way better than it was before, but I can't wait until I hit that six figure a month mark which I know I'm one or two clients away from doing. Sam Ovens:	Nice. So you really were ... The big shift and transformation for you was getting a different mindset. A bigger, a larger appetite, more of a hunger and more discipline and more ruthlessness to get to the goal. Cam Erickson:	Absolutely. Sam Ovens:	Cool. Yeah, for anyone listening, if you haven't read that book, buy it now. It's called Relentless. It's by Tim Grover and pick in up on Amazon. It's worth a read for anyone, no matter what you're in, just get it, read it. I've read it, like, four times. It's so easy to read, too, 'cause it's written in very plain English. Cam Erickson:	Yeah, I know. Which, by the way, a lot of times I've watched videos of people that I put in my montage who will ask, "Explain to this to me like you would to a five-year-old." And very simple English is really good. Two, three-syllable words. Sam Ovens:	Mm. Yeah. Cam Erickson:	Not sales jargon and projections. I mean, consultants nowadays, like you say, they don't have to fly around in business suits and briefcases and have Harvard MBAs. You just have to help somebody get from where they are to where they want to be. Sam Ovens:	Yup. It's funny. I always say clothes are so not important that if one dude had the best suit in the world and another dude was literally naked, if the naked dude was better at solving the problem, people would still hire him. They would let that part go. They're like, "Well, we'll get the result, screw it." Cam Erickson:	Yeah. Sam Ovens:	It's all about that and not about the other thing. You want to keep the main thing the main thing. I think a lot of people get distracted, and they're like, "Oh, I've got to look good, and I've got to fit this profile," but they forget about what they're actually there to do. Cam Erickson:	Absolutely. It's nice to have the flexibility to go out and buy a suit if I want to, but I was able to pay for, I'm able to pay now for like a very impressive office. And it's nice to do that, but it really is just about you can be in your pajamas or your birthday suit, if you don't really want to wear a suit, and really just help people out. Sam Ovens:	Yup. And so what was your ... You've been in Accelerator for a while now, and I'm sure you've looked at the other members and what they're going through and you've been in their shoes. What would your number on piece of advice be for them? Cam Erickson:	My number one pieces of advice would be to always showcase your successes and be a net asset, not a liability, and ask for help if you need it, but definitely don't get down in your abilities because one, failure isn't failure. It's a chance to bounce back, and two, failure's a great learning experience, which isn't failure, and three, failure is an opportunity to grow and "not fail" as much in the future and learn from your mistakes. So just focus on your successes as you go in with constant action every day. It was great to go from introducing myself in the group for the first time to ringing that first bell to just a couple of weeks ago ringing that second bell for 4,000 a month plus tons of cool incentives and a trip around the world, you know, first-class. It's really cool to be able to do that, so showcase your successes and not focus on failure because it's- Sam Ovens:	What do you mean by showcase your successes? Cam Erickson:	Just don't get hung up if a client or the strategy session doesn't go well because it's an opportunity to learn. And you can showcase that as a success. Sam Ovens:	Got it. Cam Erickson:	And when you get- Sam Ovens:	So turn a negative into a positive. Cam Erickson:	Yeah, exactly. When you get a client, it feels great. And you should showcase that and not focus on or get hung up on failure 'cause you will succeed if you do the work. Just do the work and you will succeed. Sam Ovens:	Awesome. That's good advice. Cool, man. Well, thanks a lot for jumping on and sharing your story. The first political one I've had or that I'm aware of, so that's cool to see. And I'm sure it's gonna help a lot of the members in here in the community, and it's probably gonna inspire a lot of people to join the Accelerator program, too, so thanks a lot for jumping on and sharing your story. Cam Erickson:	Yeah. Thanks so much, Sam. You really helped me and a lot of people, and I hope to keep in touch and see you around soon. Sam Ovens:	Awesome. Thanks. Cam Erickson:	Thank you.